Pumping liquid CO2 requires unique challenges to high pressure pumps. CO2 has a tendency to go to a gaseous state, so strict control of the temperature and pressure on the inlet and discharge of the system will help maintain the CO2 in a liquid state. Typical applications can be industrial laundry cleaning, CO2 re-fill stations and cleaning of parts with CO2. 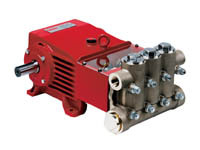 Giant Liquid CO2 Plunger Pumps have a flow range up to 52 GPM (196 L/min). Giant Liquid CO2 Plunger Pump models with a flow range up to 52 GPM (196 L/min).